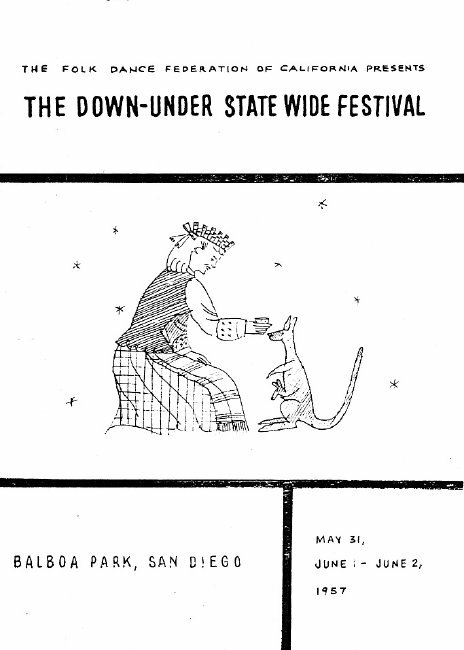 In 1957 we were invited to San Diego for the Annual Statewide Festival number twelve, referred to on their program as "The Down Under Statewide Festival." While San Diego is a "fur piece" from San Francisco and Northern California, most of us made it in time for the Friday night Party as May 31st was a holiday. There were some, in fact, who drove down Thursday night to be ready for all the festivities Friday, which were many. The Lafayette Hotel, located slightly off the beaten path, was the headquarters where most of us from the North were staying. A 10:00 a.m. tour of the famous San Diego Zoo was the first scheduled event with a 1:00 p.m. Mexican tour to follow. For the evening, a Square Dance Festival was to take place in the Conference Building with two After Parties from 12:00 midnight at the Lafayette and Hiedelberg. Quite a busy first day. The folk dancers Teacher's Institute took place Saturday afternoon in the Federal Building with a Square Dance Workshop in the Conference Building. A new feature was added with a Pageant to be held in the Ford Bowl from 7:00 p.m. till 9:00 p.m. with George Merton as master-of-ceremonies. The Pageant opened with a presentation of the National Anthem and a welcome from the Mayor, the Honorable Charles C. Dail. This was followed by two hours of exhibitions, the best the folk dancers could offer and that was plenty. This first show of its kind was a great success and set the stage for similar Pageants to follow. Following the Pageant was the Folk Dance Festival and Square Dance Festival in their respective buildings. Then followed the after parties as before with an added Square Dance Party. Quite a full day, you must admit. Not everyone attended the afternoon Institute. A mixed group of friends from the North and South decided to take a run over to Tijuana, Mexico, for the aftrnoon and stayed to see the first floor show in one of the night clubs. The following day I asked one of the girls about the excursion, especially the night club show. Her reply was, "I don't want to talk about it. It was awful!" They apparently got a little more than they bargained for in that Tijuana night club. Following the Sunday morning Evaluation Breakfast and a Caller's Swap Shop, there was a fine Costume Parade and then a Festival in the Federal Building along with a Square Dance Party in the Conference Building. During intermission, president Don Spier of the North and John Hancock of the South were introduced. A glance through the fine program brings to light a host of new names, soon to come to prominence in the Federation. I have reference to such as Gordon Engler, Frank Kane, Dean and Wilma Linscott, Nate Moore, Virgil Morton, Paul Pritchard, John Skow, Valerie Staigh, Vivian Woll, and others. The Sunday afternoon Festival was the final event although many left early for the long ride home but I am sure, all would agree, the folks in San Diego know how to put on a Statewide and much credit is due Vyts Beliajus, Vivian Woll, and the entire Committee. To those of us who were honored to act as masters-of-ceremonies, we too thank you and say it was a pleasure to serve. Goodby until next year.